In this article, Richmond Decorating – with convenient locations in Richmond, Glen Allen, and Newport News, Virginia (VA) – is here to help answer the question, does your home need vertical or horizontal blinds? Contact us today for all of your window treatment needs. A common and very important question you may ask when shopping for window treatments is whether you need vertical blinds or horizontal blinds for your home. There are several factors to consider when debating these two styles. First, it is important to understand the difference between the two. Vertical blinds are made from long vertical slats spanning the height of the windows. These slats all connect to a track at the top. You can choose to open the blinds all the way or close them by sliding them back and forth along the track. You also have the option of just tilting them to adjust the amount of light and privacy in your home. Horizontal Blinds are constructed of horizontal slats, as the name says, which are connected to each other by vertical strings. These, like vertical blinds, can be opened and closed completely or you can tilt the slats for adjusted privacy and light control. These are available in many different materials, including metal, wood, and faux wood. Both vertical and horizontal blinds have the option of many different operating systems to suit your needs. One of the most important factors to consider is the size of your windows. 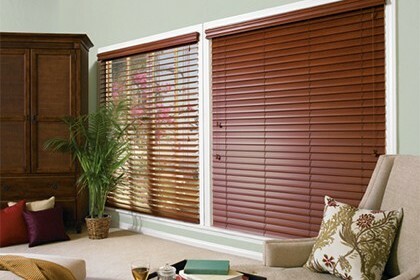 Horizontal blinds are much better suited for small windows that are taller and/or skinnier. Vertical blinds are great for large, wide windows such as picture windows, as well as sliding glass doors. Vertical blinds are much easier to move out of the way when trying to walk through a sliding glass door. If you had horizontal blinds on your door, you would have to open them completely to walk through. Vertical blinds only have to be opened partly. With smaller windows, horizontal blinds tend to be easier to operate, as well as being sturdier. In addition to size, you also should consider which direction your windows face. If they are facing direct sunlight, vertical blinds may be best for those. Vertical blinds tend to have wider slats, giving them the ability to better block out the sun’s intense rays and keep your home comfortable. Of course, you still have the ability to tilt them and move them back and forth to adjust this light, but when you want to keep out as much light as possible, these are best. Horizontal blinds are better for windows not facing direct sunlight. Additionally, and also important, is the amount of privacy you are looking for. 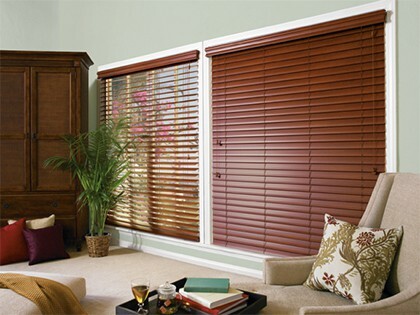 Windows in a bedroom or bathroom should have horizontal blinds. Horizontal blinds provide much more privacy than vertical blinds. With vertical blinds, it is easy to accidentally bump into them and slightly open them, allowing outsiders to see in. If you have more questions about what type of blinds you need for your home, give us a call today here at Richmond Decorating. We have convenient showrooms located in Richmond, Newport News, and Glen Allen, VA and proudly serve The West End, the South side of Richmond, and the Fan. We offer a variety of blinds and more from Hunter Douglas, as well as a large selection of flooring options. Contact us today and let us know how we can help you create your dream window treatments.